General Supplement Guidelines A guide to selecting the supplements that are right for you. The Nutritarian diet greatly enhances your health and promotes longevity, but you still may require additional nutrients for best results. Ideally, you want to take in the optimal amount of all important nutrients daily—as deficiencies or insufficiencies can undermine your health. Getting the optimal amounts of vitamins and minerals every day from our diet can be tricky—especially since absorption efficiency and utilization of nutrients varies from person to person. Read more on what may be sub-optimal or lacking even in a healthful diet. Proper supplementation can fill these gaps, ensuring that we get the ideal amount of every essential micronutrient. However, almost all conventional supplements and multivitamins contain ingredients that may pose serious health risks, particularly increasing your risk of cancer. It is critical that you do not use supplements that have potentially harmful ingredients such as folic acid, vitamin A, and others. Learn more about which ingredients to avoid. 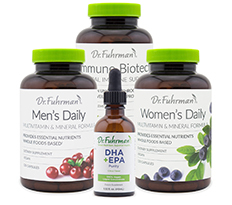 Dr. Fuhrman’s supplements are meticulously researched to determine which nutrients to include, in what form(s), and in what exact amounts; and are designed to provide optimal nutrient intakes that complement a healthful diet and maximally extend lifespan. Use the general recommendations below as a guide to select the supplements that are right for you. Calcium requirements increase after menopause for many women, and those with low appetite for high calcium foods such as greens, seeds and beans, may also benefit from supplemental food-derived calcium. Women's Daily Formula +D3 provides an extra 200 mg calcium to assure adequate intake. Depending on dietary intake, older women should also add 1-3 capsules/day Osteo Biotect (with meals) for additional food-derived calcium, vitamin D3 and vitamin K2. Even if you follow a Nutritarian diet, this added bone health support may be useful with aging. Adequate calcium and vitamin D throughout life, along with physical activity, may reduce the risk of osteoporosis in later life. See Additional Supplement Recommendations. Most premenopausal women benefit from the small amount of iron present in one capsule of Gentle Prenatal. Premenopausal women have higher requirements for iron due to blood loss during menstruation. Requirements vary however; those who experience light monthly cycles may need little or no supplemental iron while those with heavy bleeding may require more. If you are uncertain about your need for extra iron, have a ferritin blood test done to check your iron levels. Based on your blood test results, you may or may not need the iron contained in Gentle Prenatal. This information is for educational purposes only, and any advice regarding supplements is not intended to take the place of medical care. All recommendations are best discussed with your personal physician who oversees your care, especially since ferritin can be elevated in autoimmune illness and inflammation, not always because of iron sufficiency. Iron is essential for the baby’s developing brain, but excess iron promotes oxidative stress and is associated with low birthweight; too little or too much iron can be problematic. Iron supplementation should be tailored to individual needs aiming to achieve the “sweet spot” of adequacy for the baby’s development without excess, based on monitoring the mother’s iron status during pregnancy. It is wise to learn your iron status starting early in pregnancy and use this information to decide the appropriate level of supplementation to complement a health-promoting diet. Note: Dr. Fuhrman considers Pixie Vites and DHA+EPA Purity to be the core supplements for children, and Immune Biotect an optional addition. Pixie Vites provide several phytochemical-rich plant extracts to complement a healthful diet, and Immune Biotect is available for parents who feel their child would benefit from additional immune-strengthening phytochemicals. Please note that Immune Biotect may be difficult for children to take, as it is packaged in capsules; the capsules can be opened to add the powder to a child's food or drink, but the flavor may not be child-friendly. *Accidental overdose of iron-containing products is a leading cause of fatal poisoning in children under six. Keep this product out of reach of children. In case of accidental overdose, call a doctor or poison control center immediately. The products and statements made about specific products on this web site have not been evaluated by the United States Food and Drug Administration (FDA) and are not intended to diagnose, treat, cure or prevent disease. All information provided on this web site or any information contained on or in any product label or packaging is for informational purposes only and is not intended as a substitute for advice from your physician or other health care professional. You should not use the information on this web site for diagnosis or treatment of any health problem. Always consult with a healthcare professional before starting any new vitamins, supplements, diet, or exercise program, before taking any medication, or if you are pregnant or planning to be or if you have or suspect you might have a health problem.